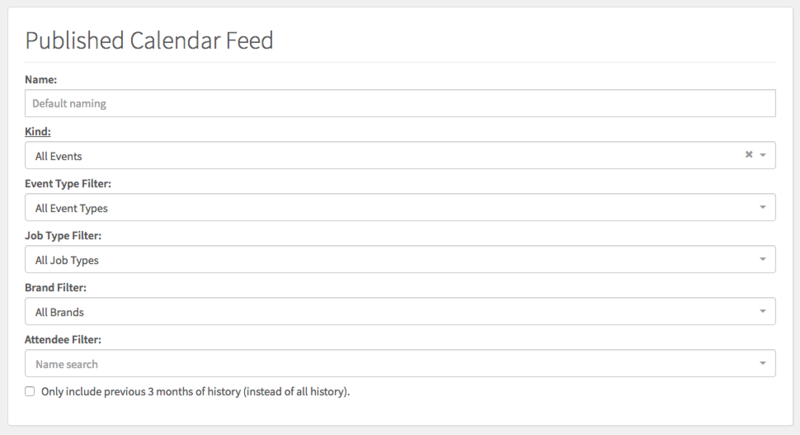 Your Táve Calendar Feeds can now be created for specific contacts, event types and job types! 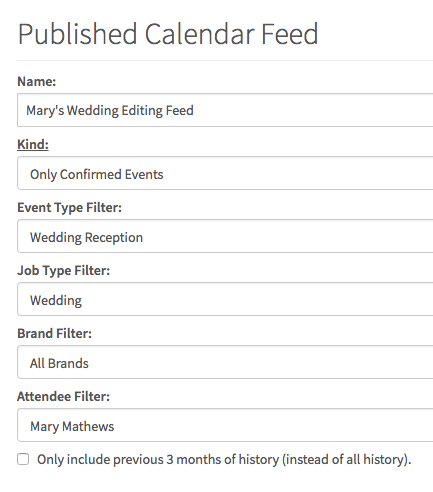 In the example below, I've created a calendar feed that combines a few of these filters to tailor my editor's calendar feed to only the events she needs to see. This feed will only include confirmed Wedding Reception events on my Wedding jobs in which Mary Mathews is an attendee. For feeds you set up specific to a certain Attendee, any Táve event that they are added as an "Attendee" on will appear in their feed subscription, provided all other filters set on the feed are met. Note: If someone subscribes to a specific calendar feed that is later adjusted to change up the filters here in Settings, they will need to be issued the updated subscription URL and swap out the two wherever they have subscribed to the feed.